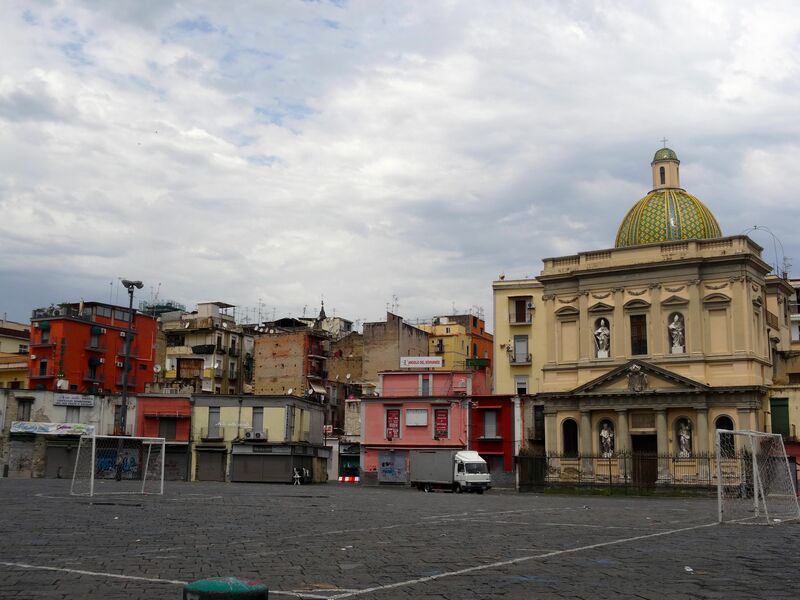 The Piazza Mercato in Naples Italy and the church of Santa Croce e Purgatorio (closed since the earthquake in 1980). On a morning of warm rain I walked the seafront of Naples in search of Piazza Mercato, a place that used to be a nerve centre for the city. For well over five centuries this piazza was where goods, power, and messages changed hands – it was the Facebook of its day. 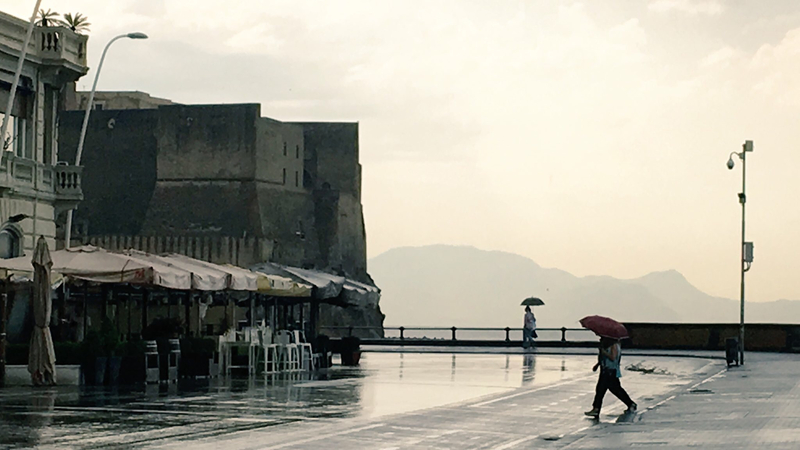 The day I chose to find it was wet but not fresh – to one side were the restaurants, all shut, and to the other was Castel dell’Ovo, a grey-gold bulk with its nose to the sea. It was a long, humid walk but I was confident the piazza would be easy to find because of the tall bell tower of its famous church, Santa Maria del Carmine. I was wrong. I couldn’t even spot that and in the end I turned away from the sea too early, into narrow, dark-stone streets that added loops on to the distance. But I was not lost for long … the old lady selling bottles of water knew the church, so did the girl leaning on the half-door of her basement home. Their directions were clear but the only problem was that what I had in mind was nothing like what I was about to find. 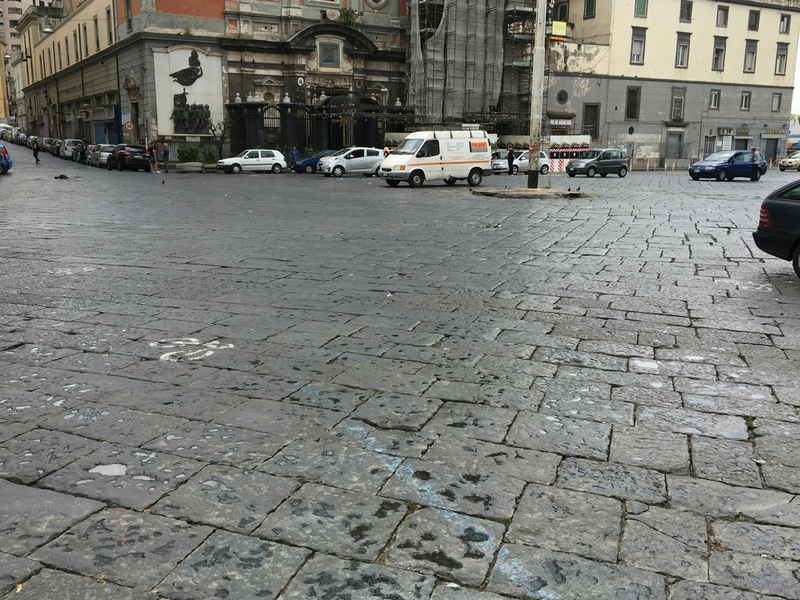 I had no idea that the half-hearted parking lot I’d wandered into was the legendary square, nor that the bruised building to my left was the Basilica Santuario Carmine Maggiore (Santa Maria del Carmine). 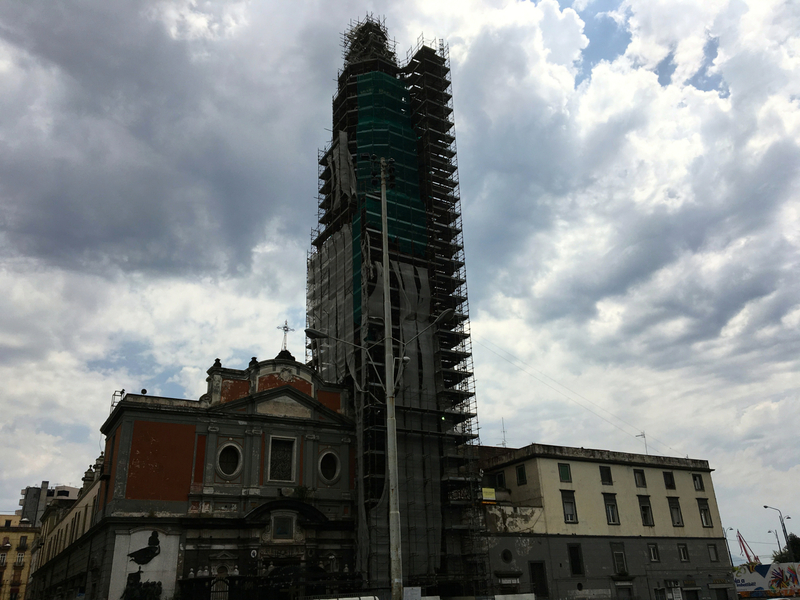 As for the bell tower … that was completely wrapped up in scaffolding. 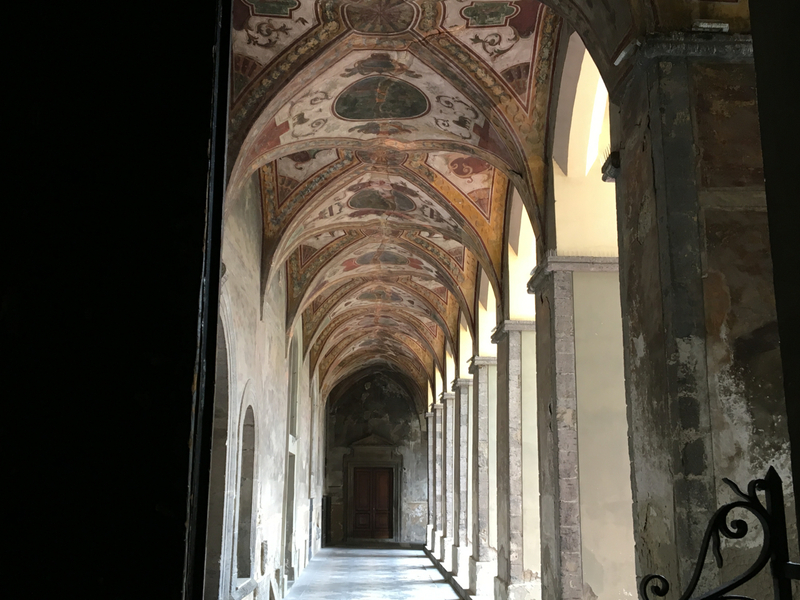 But there I was … where Naples had traded, celebrated, suffered and died from medieval times right up until the unification of Italy in the 1860s. I’m sure it still goes on but on nothing like the scale it once did. It felt so bleak … even the ghosts seemed to have gone … and the flat light didn’t help. Feeling slightly over-exposed as the only tourist for some distance I turned and made my way towards the church. As soon as I stepped through doors everything changed. I dropped into a treasure chest – memory and the old rushed at me. On my left, about halfway up the side aisle of the church, stood a young man I recognised – Conradin. I knew his story. In 1268, barely sixteen, and the last of the male line of his family, he was beheaded by Charles I of Anjou in the Piazza Mercato. The message to the rest of Europe was clear: the Church had a new champion and Sicily a new King – Charles I of Anjou – and the power of the Hohenstauffens, a family that had rattled too many popes for too long, was over. Frederick of Baden, Conradin’s companion was also executed. 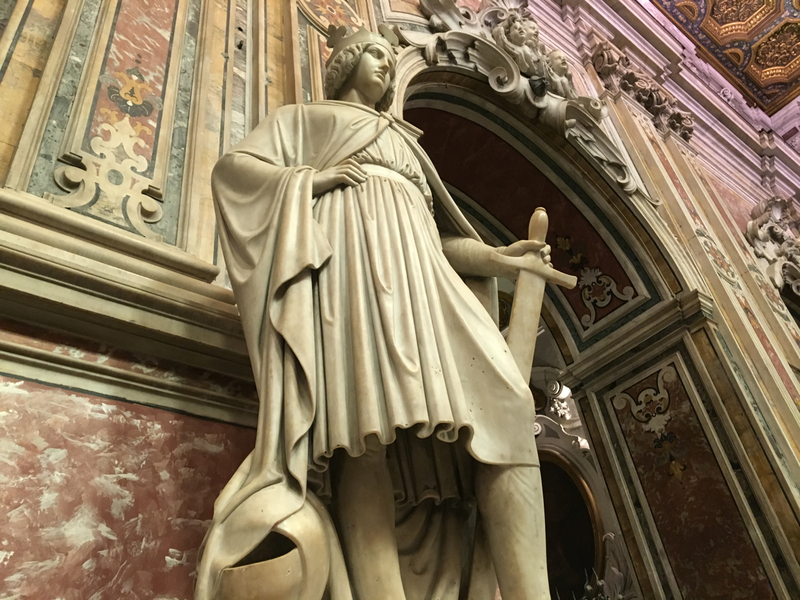 This is at the foot on the statue of Conradin in the church of Santa Maria del Carmine in Naples, Italy. I sat in a pew at the back of the crowded church and waited for the Sunday service to end. Once it was over I took a closer look at the plaques at Conradin’s feet and at another plaque on a pillar around the corner that remembered the impoverished fishmonger, Tomaso Aniello (Masaniello). 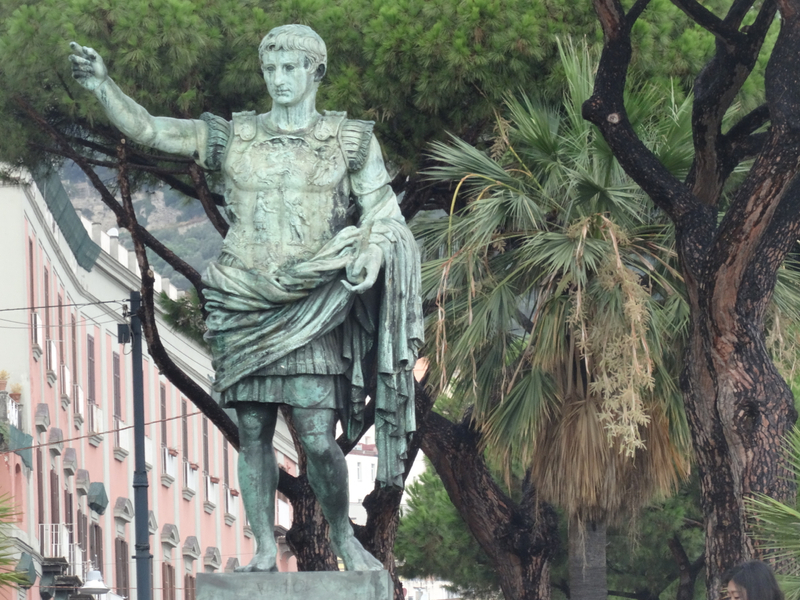 His story is also famous in Naples. He too was beheaded but about four hundred years after Conradin in 1647 … although he at least was shot before his head was chopped off and then paraded out through the pews and into Piazza Mercato. Again the message was written in bold – a leader was dead, a rebellion was over. Basilica Santuario Carmine Maggiore in Naples Italy (Santa Maria del Carmine). Masaniello’s uprising was a people’s riot and it didn’t last long. He was the one who lit the flame in the Piazza Mercato and it ended with his death nine days later in the monastery, close to where I now stood. 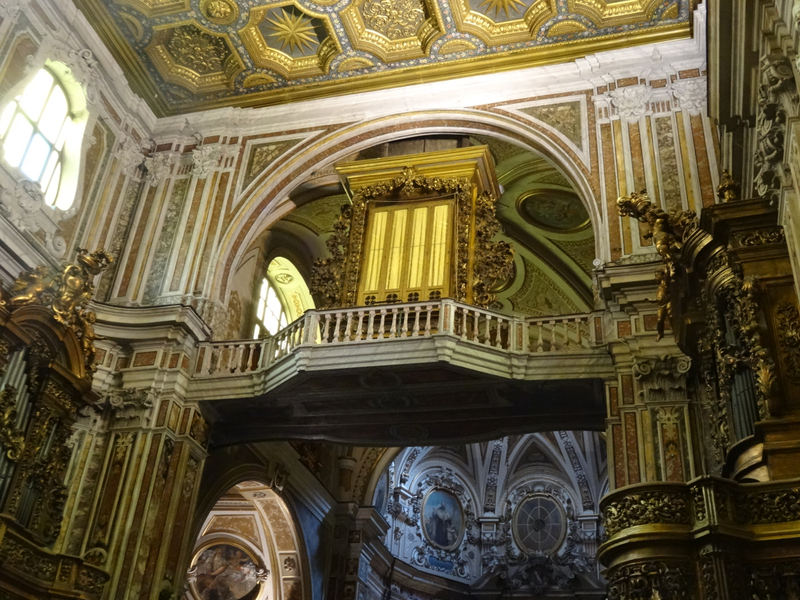 As I gazed around the church a member of the congregation urged me to go up behind the altar to see its other treasures. There, in the cramped space beneath walls covered in memory, a small crowd waited to pay their respects to the Brown Madonna. 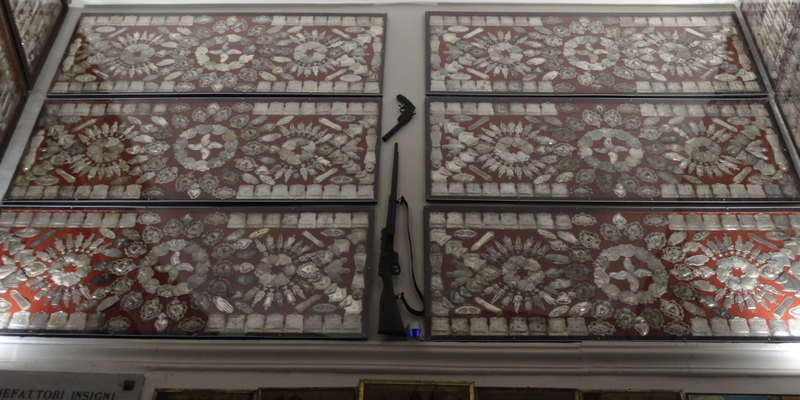 I looked to see if I could find anything in the church about the terrible plague of 1656. I couldn’t, but probably because I didn’t know where to look. At its peak this outbreak is said to have killed well over a thousand people a day until half the population, 150 000 or so, were dead. 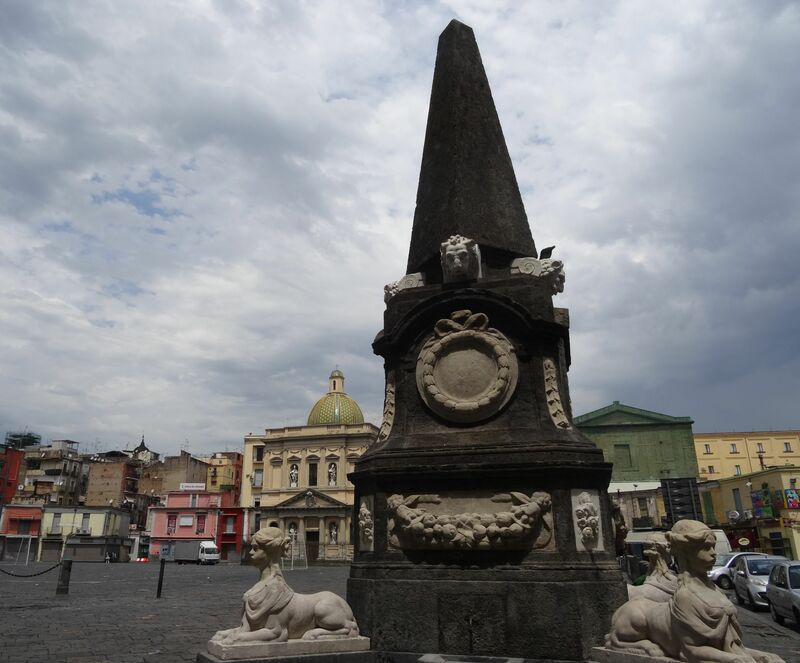 Many of those who died came from the area around Mercato – so many that in the end part of the piazza was turned into a burial pit. But even a tragedy on this scale did not bury Masaniello’s memory. 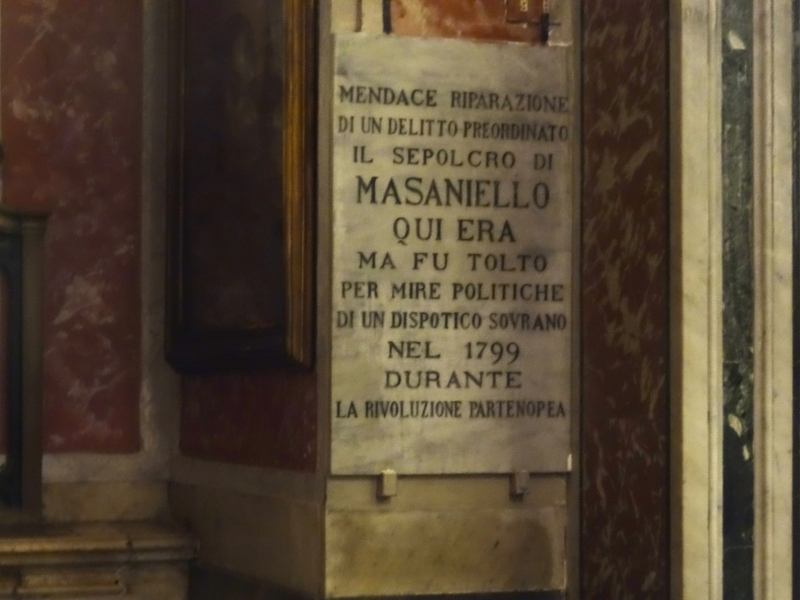 If anything his name must have grown in power because nearly a century and a half later the Bourbons removed Masaniello’s tomb from the church in case it became a rallying point for the Parthenopean Revolution. 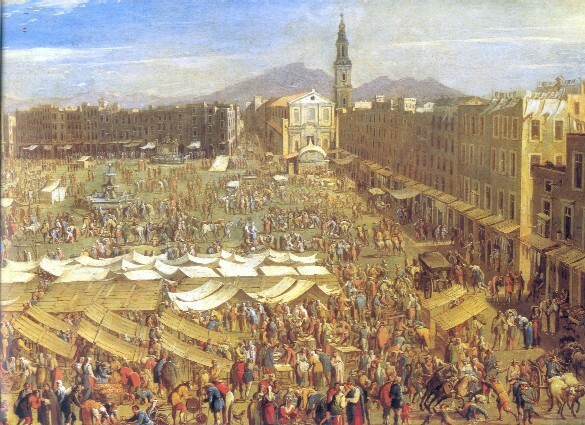 This revolution, which seems so recent compared to others (1799), also met its end in Piazza Mercato. It only lasted a few months before the revolutionaries had surrendered but even so, when Admiral Horatio Nelson returned from his trip to Sicily where he’d left the Bourbon Court, he showed no mercy. The revolutionaries thought they were about to leave for France but Nelson, probably under orders from the king and queen, cancelled promises made to let them leave the city and instead picked out key influencers, many of them important locals, and had them tried and executed. The place most of them were either hung or shot was Piazza Mercato. A rattling of large keys cleared my head of executions. 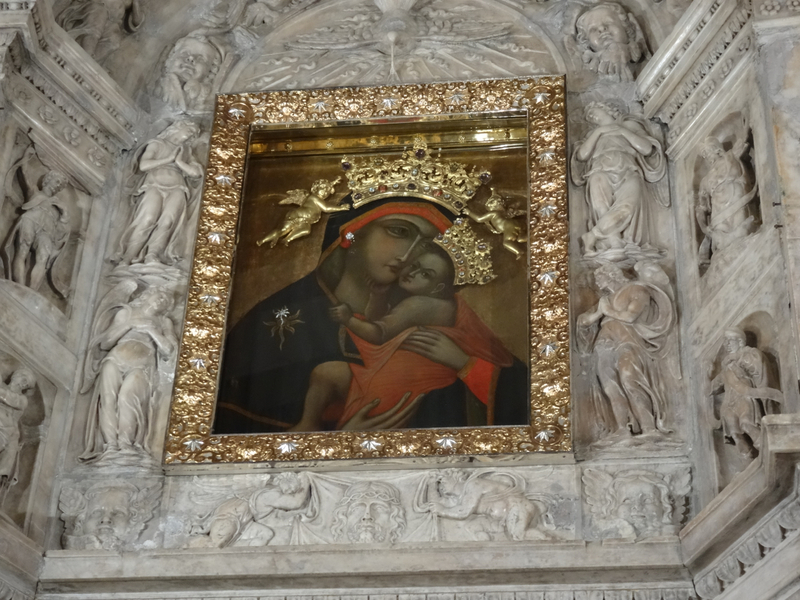 I followed the last of the congregation outside as the great doors of Santa Maria del Carmine were padlocked behind us. Suddenly all the warmth and rich memory were gone. In the empty space opposite the church two football goals stood in the centre of a curve of haphazard buildings. At either edge of the emptiness were two small obelisks each guarded by a pair of sphinx. A man approached and asked if I would like my photograph taken there – I decided I didn’t … something about the mood in the square that not even the sphinx could lift. Instead, I waved my thank you and set off back towards Castel dell’Ovo where young Conradin had been imprisoned. I was glad to be able to make the journey in both directions. 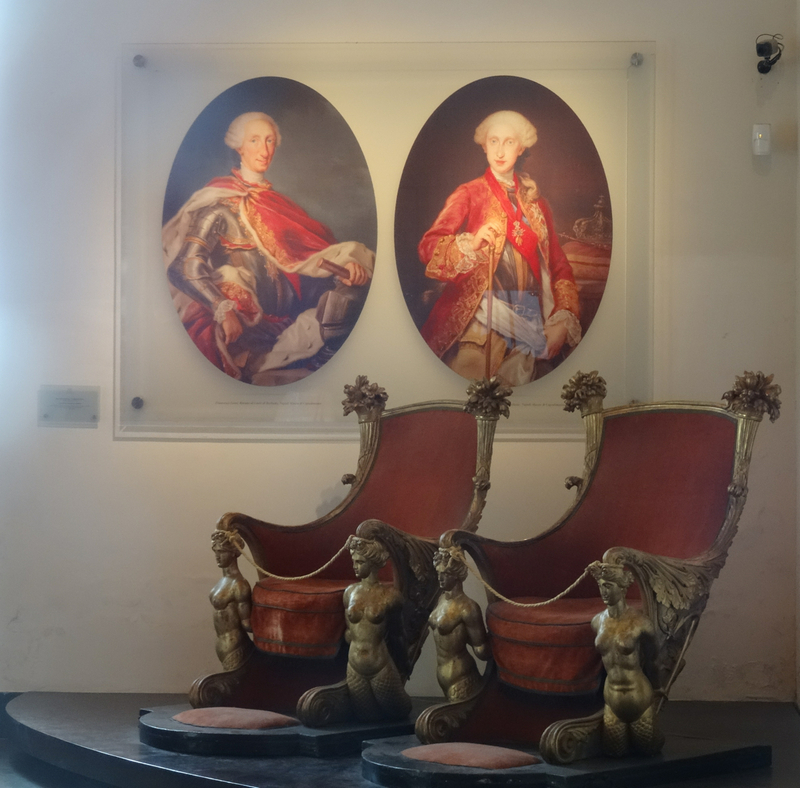 This entry was posted in Italy, Naples, Places to see in Naples and tagged Admiral Horatio Nelson, Bourbon Court, Charles I of Anjou, Conradin, Corradino, Frederick of Bavaria, Hohenstauffen, Masaniello, Parthenopean Republic, plague of 1656, Santa Maria del Carmine. Bookmark the permalink. Sorry to have to say I have not read The Leopard but I do have the book. I shall begin immediately and with interest. Thanks for your comment. I have now read The Leopard and I’m sure you’re right. Given what happened amazing how brief the mention. So right Aggie – sad for everyone, but perhaps it’s just that the change happening across Naples hasn’t quite reached Piazza Mercato yet.